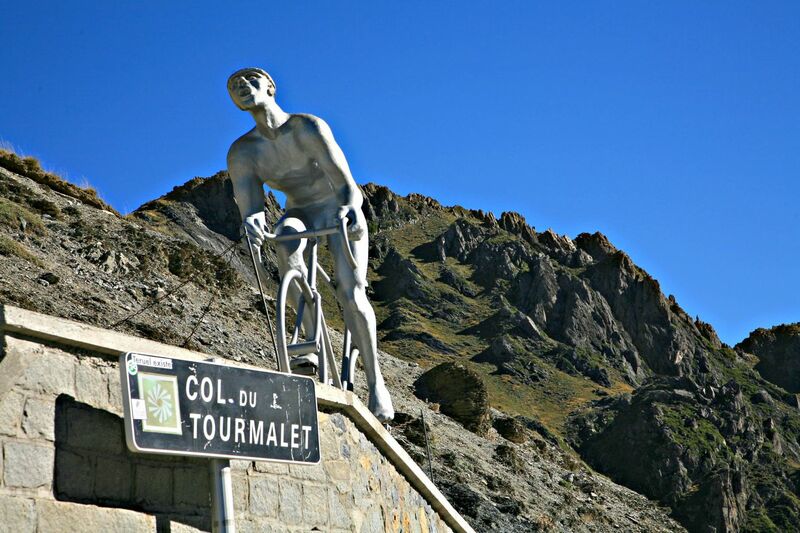 The mighty Col du Tourmalet. Lush green pastures on the Col d’Aspin. Collection and drop off are from Pau airport (flights to Paris) and rail station (direct trains to Bordeaux and Paris). 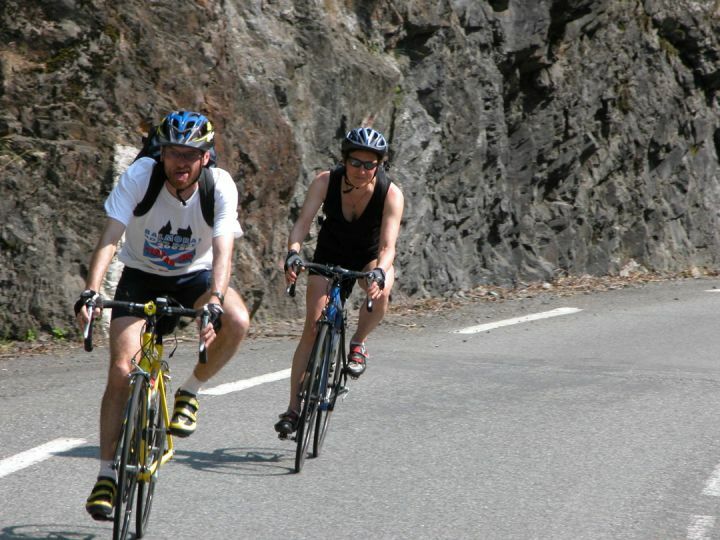 French Cycling Holidays gives you the chance to ride some of the Pyrénéen climbs made famous by the Tour de France. Our route takes in the all the great climbs of the Tour de France as it passes through the Pyrénées, plus several lesser known but equally breathtaking passes. Most day's cycling will cross at least one of the legendary cols of the Tour but, unlike the professionals, we will be able to enjoy the breathtaking scenery as we go. Optional shorter or longer routes will be available on each day's ride, so that cyclists with a wide range of abilities will be able to take part. As with all our tours we offer full back-up with guides cycling with the group and minibus support. Our guides are cycling enthusiasts and fanatical about France with a detailed knowledge of the Pyrénées and their place in cycle racing history. The Classic Cols of the Tour de France holiday will present a challenge even to experienced cyclists, but just because your legs are being put through their paces in the mountains, there is no reason the rest of you should be deprived. We will stay in three-star hotels selected for their character and ambience to ensure your time off the bike is just as enjoyable as your time on it. Evening meals will not merely be a time to refuel, they will offer the chance to indulge in some of the fine food of the region. And, of course, what better way to digest the day's events than enjoy a glass or two of wine with new friends! Transfer from Pau airport or TGV station to our hotel in Pau itself. The hotel is in the heart of the old part of the city, a few steps from the medieval chateau and the spectacular view of the mountains on the Promenade des Anglais. Bikes can be assembled at the hotel and if there is enough time there may be a chance to tackle the Col de Marie Blanque to the south of Pau, or take a loop out and back again with a couple of easy climbs to get the legs and bikes ready for the week. The distance for this optional ride is around 50km. Before dinner there will be an introductory briefing from the guides to run through the schedule and options for the week, as well as a chance to meet the other riders. Our week begins in earnest with a warm-up ride through rolling foothills - no major climbs today but plenty of kilometres through magnificent scenery. The first section takes us to the legendary pilgrimage town of Lourdes, where we stop for coffee. After this the route continues through the foothills with the majestic mountains on our right, through picturesque villages to lunch in Bagnères-de-Bigorre, a start town in many tour stages. After lunch we follow the river Garonne, here a noisy stream as it starts on its journey to the Atlantic at Bordeaux. We finish at a splendid hotel outside Sauveterre de Comminges, in enough time to relax by the large pool. A fabulous dinner awaits as a reward for the day's exertions. The first of the big passes come today so yesterday's easier kilometres will have served as good preparation to find your legs! After a steady 30km of gentle uphill, we attack the fearsome Port de Balès. First included in the Tour in 2007 (before this part of it was an un-surfaced cart track) this 1755m pass is a beast because of the constantly changing gradients which include short sections of 12-13%. We will picnic at the top of the climb, before freewheeling 15km downhill. The fun isn't over however because we immediately start the climb of the Col de Peyresourde, a veteran of 40 Tours de France since 1947. The list of riders who have been first over its 1,569m summit reads like a who's who of climbers. The descent from the Peyresourde brings us into the village of Arreau where our 3* hotel, with a refreshing pool, awaits us. Today is a loop day; no need to pack this morning as we will be returning to Arreau. There are two major climbs; the first is the little known Col d'Azet. 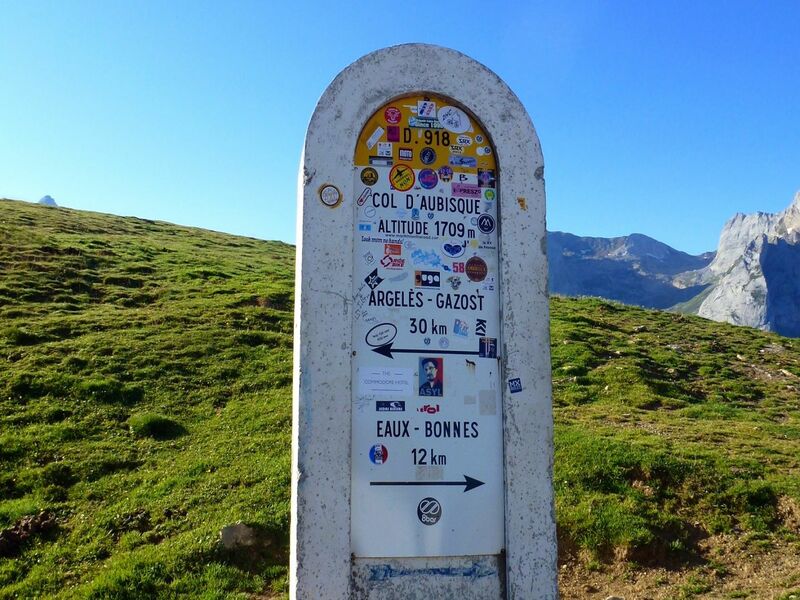 At 1,578m the Azet is one of the prettiest cols in the Pyrénées; and though quite steep, the steady gradient means you will be able to enjoy the views. We descend into the bustling town of Saint-Lary-Soulan for lunch. In the afternoon our route takes us to the ski station of Pla d'Adet at 1,675m. This has been the scene of nine mountain finishes in Le Tour – most recently in 2005 when George Hincapie took the honours. A big day! 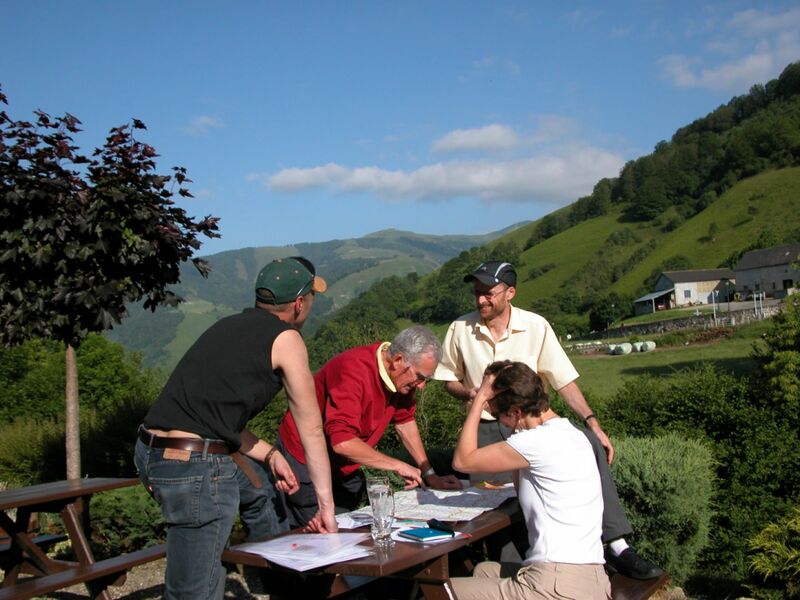 The first challenge is perhaps the most beautiful in the Pyrénées - the Col d'Aspin. After a steady climb to pass the summit at 1,489m, a fantastic descent to Ste-Marie-de-Campan, where we stop for coffee. Now for the Big One – we ride the most legendary of the Pyrénéen climbs, and one of the true giants of the Tour, the mighty Col du Tourmalet. Climbing 1,404m to its summit at 2,115m, over a distance of 19km, this is not a col to be taken lightly. The scene of some of the Tour's fiercest mountain battles, you will be glad to see the statue to Jacques Goddet as you crest the pass, and you will feel immense satisfaction at having conquered this beast of a climb. After taking lunch on the Tourmalet, we descend into the village of Luz-Saint-Saveur and turn north towards Pierrefitte-Nestalas. For the super fit, the Hautacam is a 12km detour on the way home before before a fast cycle path right into the centre of the incredible pilgrimage town of Lourdes, where tonight’s hotel awaits. Our last day of riding is slightly more relaxed. Have a lie-in, or get up early to have a crack at the Hautacam if you didn’t yesterday. This is a tough climb at 1,560m, but with fresh legs it shouldn't prove too difficult. The ride proper takes in the Col du Soulor at 1,444m. This is followed by a descent into the breathtaking Cirque du Litor then straight on to the short climb to the Col d'Aubisque, a hors categorie climb at 1,709m, but fairly easy in this direction. From the top of the Aubisque it's downhill (nearly) all the way back to Pau. At a charming restaurant a stone's throw from the chateau de Pau we meet up for a final celebration dinner. Raise a glass to a tough but immensely satisfying week of cycling and to new friends. After breakfast, transfer to airport or railway station for homeward journey. The imposing Continental is a classically designed and beautifully furnished 3* hotel, located in town centre and the heart of the shopping and restaurant area. The hotel is close to the casino, art museum and the Henri IV Chateau. Enjoying a beautiful location on the border between the Haute-Garonne and Hautes-Pyrenees, Hostellerie des 7 Molles is a charming heritage boutique hotel in Sauveterre de Comminges. This picturesque town traces its origin to the Middle Ages and is surrounded by rolling hills, luscious landscapes, magnificent churches and chateaux. The 3* hotel has a welcoming swimming pool to cool off after a hot day in the saddle and a fantastic restaurant serving regional cuisine. Completely renovated in 2013, the comfortable and traditional Hotel d’Angleterre sits at the foot of the Peyresourde and Aspin Cols. The 3 star former coaching inn has a swimming pool and a dining room that is popular with locals, a sure sign of authentic cooking! Almost uniquely amongst hotels in this bustling pilgrimage town, the Beausejour too has a heated swimming pool in its tree-shaded gardens. The 3* hotel was converted from an 18th century mansion, and is one of the oldest buildings in a town that sprang up in the late 19th century after the visions of Saint Bernadette. The legendary grotto is in walking distance.